An Israeli soldier awakens 300 years after dying in combat on 2006. He finds himself in an underground shelter-city beneath the Judea mountains where the survivors of a major climate crisis live. Now, he'll have to find his new place in the world, while fighting for the survival of the city that's facing a vicious radical group. 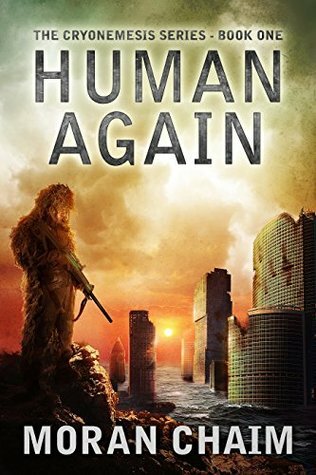 Download Human Again FREE on Amazon June 22-23, 2016! 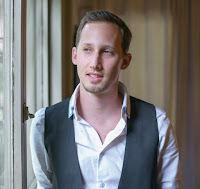 Moran Chaim is an Israeli born writer. He holds a BFA in cinema and screenwriting and participated in the second Israel-Lebanon war as a Navy soldier. Human again is his debut novel and the first book of the Cryonemesis series. Roy - the main character, is an IDF soldier who died during battle in 2006. He's been cryo-frozen for 300 years without him knowing it, so when he wakes up in the future he's alone and scared. Roy has the power and skills to help the city's security issues. But after dying once already he's reluctant to help in that way. The mystery of why he was brought back and what should he do drives him to find answers and allies in the city. Padma - she's the president of the city. As a motherly figures she takes care of the sanity and security of the people living underground as a first priority. She needs Roy as a former soldier but she's also tough on him because he's not so submissive at first. An amazing designer called Eloise J Knapp who's an author herself. Doing the cover design is one of the most fun parts because you get to see your vision alive graphically. Like it's already the final book. I try to have a very specific image in my mind and get the cover ready just after I finish with the first draft. It's a great motivator to see the cover already waiting for you to finish up and it's good for enticing beta readers in an early stage. Its has to be pretty quiet. In early plotting and sketching stages I like to write outside at the park using pen and paper. Later any quiet place with a desk and a chair could do just fine. Because the world is filled with distraction and notifications. I prefer writing early in the morning before everyone wakes up. Persistence, persistence, persistence. Success come to those who keep on trying. No preference :) I was born in the 80's and grew up to the internet era so I'm fine with all formats. Make stupid people smart in an instant. They are so annoying sometimes. I read "Compass of Zen" by Zen Master Seung Sahn. I've been practicing Buddhist meditation for 4 years now, and this book talks about the fundamentals of Buddhism and zen especially. Without it I'd be a totally different person.